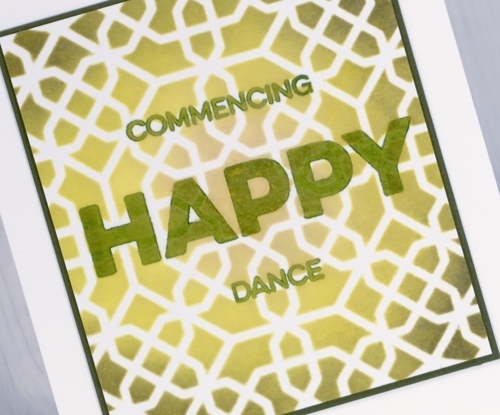 I posted some cards a couple of weeks back made with stencils from My Favorite Things. Here is another using the geometric stars stencil. 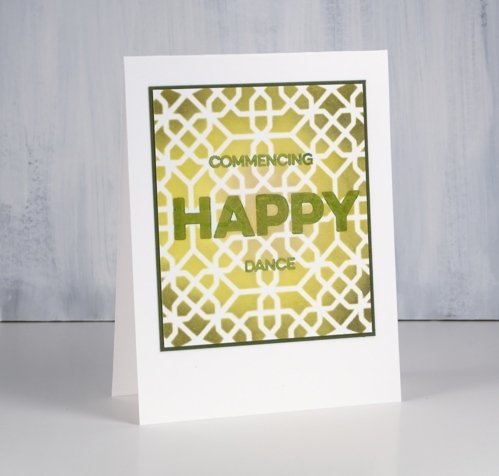 I sponged oxide inks through the stencil onto neenah solar white cardstock (colours listed below). For a bit of shimmer I spritzed the panel with my blue pearl-ex mix (made by mixing ‘interference blue’ pearl-ex with water). 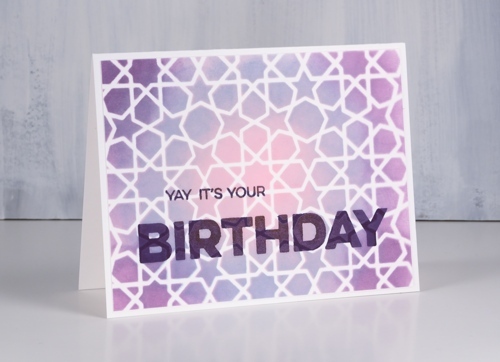 I matted with purple cardstock and die-cut 4x h, a, p, p, y using the ‘little lower case letters also from MFT. I stamped some words from the MFT Yay for you set to complete my enthusiastic sentiment. I have new MFT stencils and oxide inks in the house, a good combination for sure as the oxide inks blend so very nicely. The stencils are the focus on today’s cards but I’m sure I’ll have them providing subtle backgrounds on cards in the future. I’m over on the Foiled Fox blog today talking about these cards and my choices for each one. 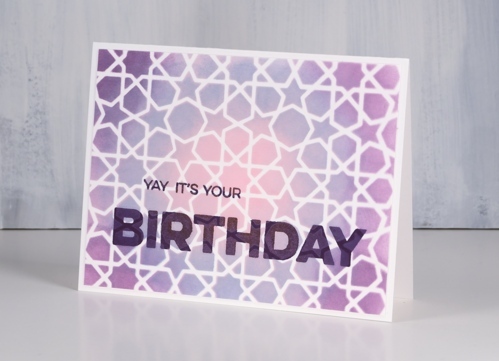 The first card features MFT ‘geometric stars’ stencil. 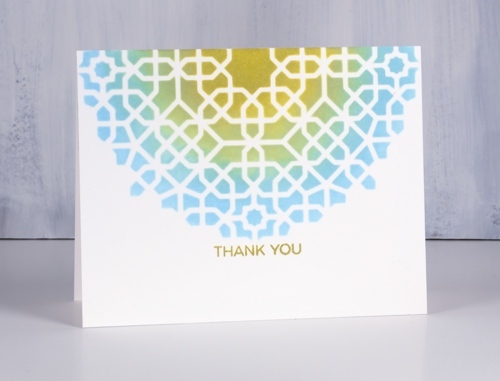 The next two cards are made with the MFT ‘Moroccan mosaic’ stencil. 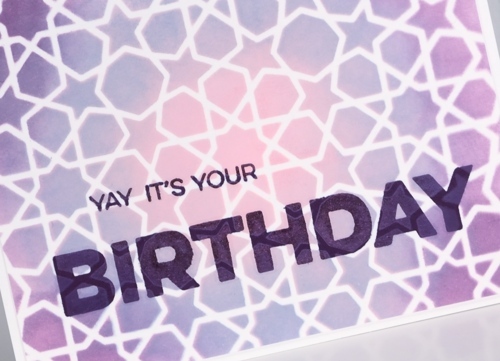 I used mini ink blending tools and Neenah solar white cardstock to create all the cards. I paired the new crushed olive with the older forest moss. (There is also some antique linen in the middle there but it’s covered up by the HAPPY!) 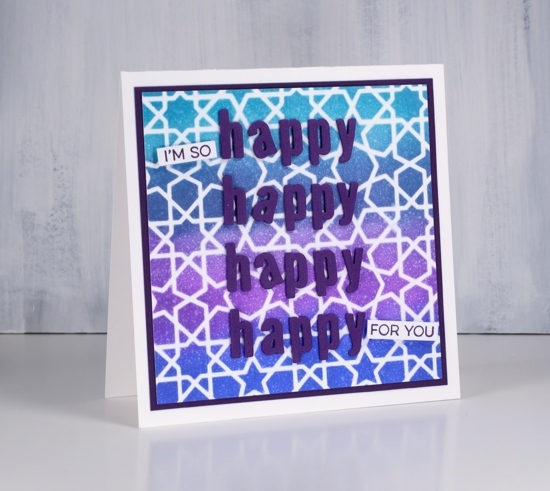 I had fun mixing and matching with some MFT sentiment sets to create all my messages and I love the way the stencilling underneath affects the stamping over the top. For my final card it was again new oxides, tumbled glass and crushed olive. 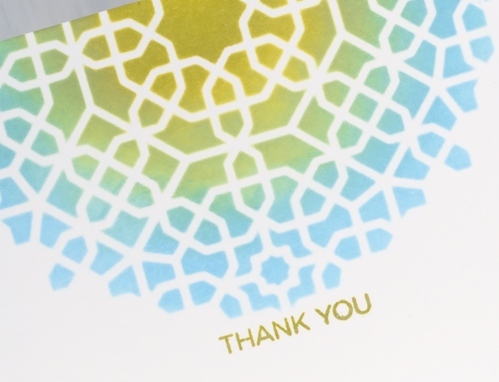 If you have never blended with oxide inks, you probably should; it’s very satisfying. I was happy with these colour combos; I’d love to hear which oxides you like to put together.